Puccini’s most popular work – indeed the most popular piece in the entire operatic repertoire these days – La Boheme returns in Richard Jones’ pared down production. Pared down, that is, apart from the second act, when the Cafe Momus erupts in a whirl of hyperactivity, with three shopping arcades sliding on and off, and an unusually glamorous restaurant – surely far above the Bohemians’ most optimistic pockets – provides the evening with a brilliant set-piece of top-quality stagecraft. Here, too, Danielle de Niese launches her unforgettable portrayal of Musetta, a complex, unhappy and in this scene distinctly drunk individual whose antics nevertheless have the audience eating out of her hand. She clearly understands the young woman in some depth, as later scenes reveal. 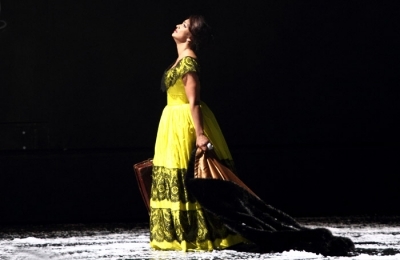 By her side Maria Agresta offers a classic Italian lyric soprano as Mimi, and like De Niese she shows us an individual of genuine strength, and not merely the kind of ‘little woman’ Puccini is still sometimes accused of portraying. Her tone is varied and sensitively deployed. These high-quality performances are matched by American tenor Matthew Polenzani’s buoyant, stylishly sung Rodolfo and Etienne Dupuis’ firm but volatile Marcello. Duncan Rock’s happy-go-lucky Schaunard and Fernando Rado’s vocally solid and emotionally sombre Colline flesh out the Bohemian quartet. Smaller roles are in the safe hands of Jeremy White as a gullible Benoit and Wyn Pencarreg as a put-upon Alcindoro. Nicola Luisotti conducts an interpretation that could do with keener rhythmic attack and more momentum generally, but which is often beautifully observed at a local level. He draws fine tone and shapely phrasing from the orchestra, while the chorus throw themselves into their big Act II scene with obvious relish.